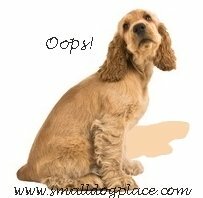 Submissive Urination is worrisome for some small dog lovers who deal with it daily. If you are having problems with your dog urinating in front of you during greetings or when you are assuming a dominant stance, chances are it could be submissive in nature. Before you come to that conclusion, you need to rule out out other possibilities. It is important to have your dog checked out by a veterinarian. Some medical problems cause dogs to urinate more frequently such as bladder infections, bladder stones, or other health problems. These need medical attention. Simply put, submissive urination is a form of canine communication common in the dog world, but not so appreciated in human terms. Puppies and young dogs tend to urinate as a way to show submission to someone who they feel is dominant over them. Older dogs may pee if they feel anxious or stressed in a situation and feel the need to appease their owner or another dog. Although submissive urination may occur at the same time as excitement urination, there are different causes and occurs at various times including greetings. Even though they are similar, dogs that have housebreaking problems such as these are usually shy or insecure, females, young puppies that are startled, or ones that have been harshly repeatedly punished. If there is more than one dog in the household, the lowest ranking member is likely the one with the problem. Your omega dog. Urinating in dog language is a sign of respect for those in leadership. When they urinate, they are saying, I know you are the leader and I’m a follower. If you want to consider yourself the alpha, then your submissive dog is the omega. In times of stress, the urinary sphincter relaxes releasing the urine. The dog does not have control over this at the time. Keeping the environment calm and as stress-free as possible for insecure dogs is the key to preventing this type of behavior. Since we don’t have complete control over what happens, it is unlikely that we will be able to avoid it entirely. Reducing the occurrence of urination should be your goal. How Do You Know If Your Dog is Showing Signs of Submissive Urination? You will be able to identify submissive urination if your dog pees almost unconsciously in certain circumstances. If they show a body posture such as rolling over to show their belly, or tucking their tail under. These are all obvious signs that what you are experience is not normal urination, incontinence or excitement urination. I once had a little girl named Snickers, who was very shy and reserved, but as sweet as can be. She was fine with me and most of my family but any event that she perceived as threatening brought on her peeing right in front of me. The problem was bad when strangers came to the door, but people who actually came into the house caused real stress. Even friendly visitors who wanted to pet her or even talk to her caused her to go into a panic mode. She is a typical example of the type of dog that has problems with submissive urination. Which Dogs are Most at Risk for Submissive Urination? Confident puppies and adult dogs do not show any signs of submissive urination. Shy or timid dogs, however are at high risk for peeing at the most inopportune moments. There are many reasons why dogs might be shy or timid and both genetics and environment play a roll. If a dog has a history of being abused or punished harshly, they are also at risk. How to Deal with Submissive Urination? Keep a patient mindset. If you have a puppy, assume he will grow out of this simply through some reassuring behaviors on your part. Maintain the environment as stress-free as possible. All greetings and departures should be quiet and brief. Use the same methods described above for greetings; your dog understands your body language much better than he recognizes your speech. (Squat to greet, no eye contact, turn sideways, scratch or pet his ears, chin or chest, not head). Alternately, you might consider postponing any greetings for about 10 minutes which is about enough time to allow your dog to calm down. Walk in and ignore your dog, staying busy with something until the dog calms down. Then greet him as above. If the dog does urinate, just ignore the behavior; reassure the dog that everything is Okay. Clean up the mess without making a fuss. Use an enzymatic cleaner to eliminate any odor. Always reward and praise your dog when he urinates where and when you want him to do so. Fearful dogs become even more anxious when they perceive our body language or posture to be a threat. As mentioned above we can improve the situation by the way we interact with the dog. Don't lift your hand above his head or body to pet him. Rather, reach under his chin and scratch behind his ears. Fearful dogs are not going to appreciate their heads scratched or patted. If your dog’s uncontrolled urination is part of a more generalized anxiety, treating the underlying fear and anxiety will be necessary. There are many different types of calming agents on the market today all of which work reasonably well. Your veterinarian should be able to prescribe something for an overly anxious dog. Talk to your vet about products that will help. Music in the environment can help. Read more about calming an anxious dog in this way. Greet the dog in a dominate way: Bend over from the waist, hovering over his body, look at him directly in the eye, pat his head. If he urinates, it is likely submissive urination. If your dominate stance does not get a reaction in your dog, you are most likely dealing with Excitement Urination, assuming that you have ruled out all health related reasons for inappropriate urination. This is a homeopathic product that I've used for a long time. It made a big difference in one of my dogs that had chronic separation anxiety. You can't overdose on it, so you can use it as needed. A few drops usually makes a big difference. Some people find that these garments often called thundershirts work well for generalized anxiety. The science behind these products is that gentle constant pressure will reduce stress levels without interfering with regular movement. They are washable and the fabric is breathable so they don't make the dog uncomfortably hot. Check the sizing before ordering.